Those were coach Edmond Tarverdyan’s words to Ronda Rousey in between the first and second rounds of Rousey’s UFC women’s bantamweight title defense against Holly Holm at UFC 193. Two minutes later, Rousey was out cold on the mat at Melbourne’s Etihad Stadium, a UFC record crowd of 56,214 serving witness to the fact Holm was the one doing beautiful work. Tarverdyan’s words, uttered just before Rousey’s reign came to a crashing halt, may as well serve as the coda to an entire fight camp which seemed doomed from the get-go. Back then, DeMars seemed like an overbearing soccer mom. Today, she sounds like an oracle. There was the news of Tarverdyan’s bankruptcy case, in which he claimed zero income during the period Rousey rocketed to superstardom. 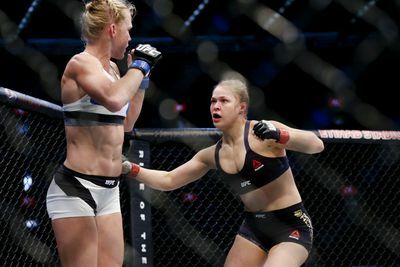 UFC 193 results recap: What’s next fight for Joanna Jedrzejczyk?